The story of the atomic bomb started around the turn of the century when a small number of physicists began to think about, discuss, and publish papers about the phenomenon of radioactivity, the behavior of alpha particles, and the properties of various materials when irradiated. Initially, these persons included well-known scientists such as Ernest Rutherford of New Zealand and Great Britain, Neils Bohr of Denmark, Pierre and Marie Curie of France, and Albert Einstein of Germany. Later, the “nuclear group” was joined by Leo Szilard of Hungary, Otto Hahn of Germany, Michael Polenyi of Hungary, Walter Bothe of Germany, Lise Meitner of Austria, Hantaro Nagaoka of Japan, and others of similarly diverse backgrounds. By the early 1900s these scientists were studying the structure of the atom and the deflection and scattering of alpha particles. In 1908 Rutherford showed that the alpha particle was in fact an atom of helium; in 1911 he announced that he had found the nucleus of an atom to be a minute but concentrated mass surrounded by electrons in orbits. By the 1930s the nuclear scientists were exploring the revolutionary concept of splitting an atom of uranium with a neutron. The early 1930s saw the rise of anti-Semitism in Germany and Russia. Hitler became Chancellor of Germany in 1933, and the Nazis began to abolish the civil rights of German Jews and to start their campaign of persecution. German scientists who were Jews realized that the Nazis posed a deadly threat, and they began to emigrate, mostly to the United States. The emigres over the 1930s included Einstein, Theodore von Karman, John von Neumann, Eugene Wigner, Leo Szilard, Hans Bethe, Edward Teller, Lise Meitner, Enrico Fermi, and many others. Although not Jewish, Enrico Fermi had married a Jewish woman, and he feared and despised Mussolini’s anti-Semitism. These emigres continued their research and discussions in the United States and in Britain. By 1939 the thinking of nuclear scientists had progressed to such subjects as fission of uranium atoms and causing a chain reaction, particularly in the U235 isotope, when the material is bombarded by neutrons; the comparative effectiveness of slow neutrons versus fast neutrons in achieving a chain reaction; and the possible methods of separating U235 from U238 in natural uranium. The possibility of producing a massive atomic explosion was generally known and discussed, and calculations of a “critical mass” were being made. German intelligence had discovered the direction of nuclear research in the United States and Great Britain. The German War Office consolidated research under their leading physicists Erich Bagge, Werner Heisenberg, and Paul Harteck. One of the issues being studied was the use of heavy-water as a moderator, used to slow the travel of secondary neutrons. In the United States, in the summer of 1939, a small number of physicists, alarmed over the possibility of Germany successfully developing an atomic bomb, decided to warn President Roosevelt. A letter was written by Einstein and Szilard, and was delivered to the President’s aide, General Edwin Watson, by Alexander Sachs, an economist and writer who had a friendly relationship with Roosevelt. Sachs was given an appointment with the President to whom he read Einstein’s letter. The letter described the new powerful bombs that could be produced and recommended that the U.S. Government speed up experimental work currently taking place. Einstein closed his letter by stating his understanding that Germany had stopped the sale of uranium from Czechoslovakian mines and that Carl von Weizacker, a highly respected German scientist, was attached to the Kaiser Wilhelm Institute in Berlin where American work on uranium was being repeated. These last remarks reflected the concern of U.S. nuclear scientists over German capabilities. The meeting with Roosevelt took place on October 11, 1939. The ensuing months saw the establishment of nuclear-devoted committees in the various departments of the U. S. Government and the continued research and inter-agency coordination of results. In 1941 James Bryant Conant opened a liaison office between the British government and the National Defense Research Council of the United States. The Japanese bombing of Pearl Harbor on December 7, 1941, accelerated the development of an atomic bomb in the United States. In the spring of 1942 the decision was made to consolidate development activities in Chicago. The objective was to produce a nuclear chain reaction by the end of the year. Fermi and colleagues moved from New York, where they had been using the resources of Columbia University, and commenced operation on the premises of the University of Chicago. To build an experimental “pile” to demonstrate the feasibility of a controllable chain reaction, Fermi assembled the components (6 tons of uranium and 250 tons of graphite for use as a moderator) in a squash court in the abandoned University of Chicago stadium. Manually-operated cadmium rods were used as a control method. On the afternoon of December 2, 1942, with 42 observers watching the instruments and listening to the clicking of the neutron counters, the pile achieved criticality, i.e., a self-sustaining nuclear reaction, operating 4 1/2 minutes until the rods were reinserted. Earlier, in the spring and summer of 1942, nuclear scientists and their leaders in the United States became aware of a new material created by neutron bombardment of U238. This material was named plutonium by its discoverer, Glenn Seaborg. The use of plutonium for bombs would have several advantages over U235: greater explosive power, smaller size and weight, and easier manufacturing. Its atomic designation became Pu239. In Germany, theoretical knowledge of atomic physics and the potential application of that science to weapons was abreast of that in Britain and the United States. German scientists, however, were handicapped by shortages in materials and funds. Developments with long range application inevitably received priority behind those of immediate benefit to the war effort. Albert Speer in June 1942 discussed with Hitler the possibility of developing an atomic bomb but with no clear conclusions. German research would continue but without focus on weaponry. Allies’ intelligence was not aware of this situation. The British were concerned about German acquisition of heavy- water produced at Vemork in southern Norway. A glider-borne British attempt to sabotage the installation in November 1942 was a failure, due to a combination of poor planning and bad weather. In February 1943 a Norwegian commando team made another attempt and succeeded in demolishing most of the plant, interrupting production for many months. In the autumn of 1943, the British received news that the plant had resumed production of heavy-water. Increased security there by the Nazis ruled out another sabotage effort, and a precision bombing attack was approved by British-American representatives in Washington. On November 16, 1943 the attack was made by 140 B-17s from the Eighth Air Force. The power plant was destroyed and the electrolysis unit damaged, effectively shutting the plant down. The Nazis elected to rebuild in Germany and planned to transport by rail and ferry the equipment and existing heavy-water that remained. The British decided to sabotage the ferry that would be involved. The sabotage attempt was successfully made by a three-man Norwegian team on February 20, 1944, sending the ferry and its cargo to the bottom of a Norwegian lake. After the war a member of German Army Ordnance claimed that the loss of heavy-water production in Norway was the main factor in German failure to achieve a self-sustaining atomic reactor. 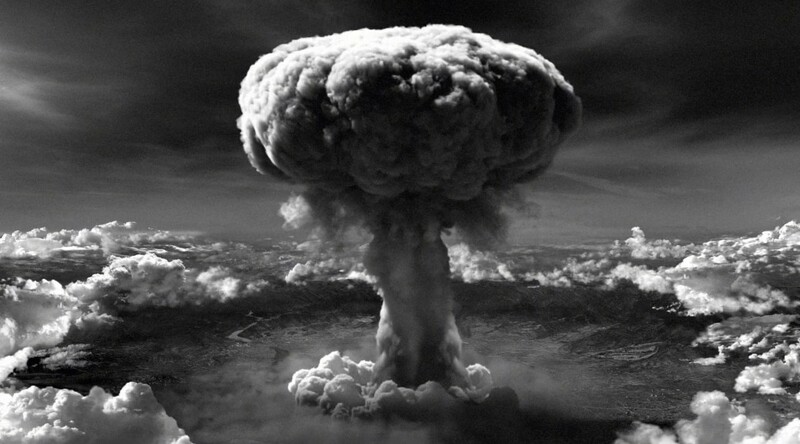 In Japan, studies toward an atomic bomb began within the military. General Takeo Yasuda, director of the Aviation Technology Research Institute of the Imperial Japanese Army, followed the international scientific literature and in 1938 and 1939 noticed the discovery of nuclear fission. He directed his aide, Lt. Col. Tatsusaburo Suzuki, to prepare a report. Suzuki reported back in October 1940 and concluded that Japan had access to sufficient uranium in Korea and Burma to make an atomic bomb. Yasudo turned to Japanese physicists, who had worked with Neils Bohr and Ernest Lawrence, and who had built a cyclotron at a laboratory in Tokyo. In April 1941 the Imperial Army Air Force authorized research toward the development of an atomic bomb. During the war, Japanese nuclear efforts were severely handicapped by the effects of the war on their industrial economy. By late 1944, many Japanese scientists, probably including their leading physicist, Yoshio Nishina, realized that they would not be able to build a bomb in time to effect the outcome of the war. In the Soviet Union work toward an atomic bomb had begun by 1939. A leading Soviet physicist, Igor Kurchatov, had alerted his government to the military significance of nuclear fission. The German invasion in June 1941 temporarily halted the nuclear program and caused the rearrangement of research priorities to the disadvantage of atomic bombs, at least for the time being. After reassessment by the Soviet atomic community, work on a weapon program resumed by early 1943. In the United States, the Manhattan Project (a name adopted for security reasons and derived from its birthplace) moved into high gear, even before Fermi had completed his demonstration of the feasibility of a controlled chain reaction. In September 1942 responsibility for managing the Manhattan Project was given to Leslie R. Groves, a colonel (soon to be promoted) in the Corps of Engineers. One of Groves’ first major decisions was to select Oak Ridge, Tennessee, to be the site for plants for isotope separation, to produce U235 from U238 in quantities sufficient for atomic bombs. Groves planned to use two competing technologies for the separation process: electromagnetic and gaseous-diffusion. The electromagnetic process required the use of massive magnets to separate the lighter U235 from the heavier U238. The gaseous diffusion process employed a porous barrier through which uranium hexaflouride gas would be pumped; the lighter molecules of U235 would pass through more readily than the heavier ones of U238 and could be collected via a chemical process. Construction by the contractor experienced no unusual difficulties, but a nationwide shortage of copper for the massive magnets for the electromagnetic system had to be solved by using silver, which came from the U.S. Treasury Depository in huge quantities. By October 1943 the system was ready for testing. However, it soon became apparent that the magnets were plagued by numerous electrical shorts, caused by faulty design and manufacture. All of the 48 magnets had to be rebuilt. Finally the system was ready for operation in January 1944. Thousands of diffusion tanks for the gaseous-diffusion process would be required. Selection of a suitable barrier material was a difficult problem, causing a dispute among adherents of competing approaches. Groves finally decided to submit the matter to a British-American committee, who ratified a decision that he had already made to use a new but superior design that would further delay production. The date of Groves’ decision was in early January 1944. In early 1945 Oak Ridge began shipping weapon-grade U235 to Los Alamos, where weapon development was taking place. In early 1943 Groves had selected Hanford, Washington, as the site for plutonium production. The selection of Hanford over Oak Ridge was based on the former’s remote location, which militated against disastrous results if a nuclear accident occurred. Major design, recruiting, and construction problems existed, but the principal buildings were ready for installation of the first nuclear pile by February 1944. Plutonium production in quantity began in December 1944. The next major problem, which surfaced in late 1942, was the establishment of a laboratory for work on bomb design. General Groves favored Robert Oppenheimer as the director, although Army counterintelligence objected because of Oppenheimer’s former friends who had been Communist Party members. Groves was able to convince Vannevar Bush, the head of the Office of Scientific Research and Development, that no one else could be a better choice. Both Groves and Oppenheimer agreed on Los Alamos, New Mexico, to be the site. The site was on the grounds of a boys’ school located on a rugged mesa thirty-five miles northwest of Santa Fe. Manning and construction started in early 1943. The remoteness of the site made recruiting of qualified personnel difficult, but Oppenheimer was able to appeal to most candidates’ patriotism. There were two possible approaches to bomb design. The first was to achieve a critical mass and the resulting nuclear explosion by very rapidly joining two sub-critical halves and initiating a neutron source. This approach was called the “gun type” since the system used a tube in which the two halves were fired toward each other. The other, newer approach used a ball (called core) of fissionable material surrounded by a number of lenses of explosive which when detonated squeezed the ball into a critical mass. The neutron initiator was located in the center of the core. This approach was called the implosion method. The gun-type was considered the more reliable; the implosion method required simultaneous detonation of the lenses and was relatively risky. In early 1944 the Army Air Forces started its program to develop a delivery capability using the B-29 aircraft. The B-29 was the logical choice in view of its long range, superior high-altitude performance, and ability to carry an atomic bomb that was expected to weigh 9000 to 10,000 pounds. In March and again in June dummy atomic bombs were dropped by B-29s at Muroc Army Air Force Base in California to test the release mechanism. In August seventeen B-29s entered a modification program at the Glenn L. Martin plant in Omaha, Nebraska, to apply the lessons learned at Muroc. That month the decision was made to train a special group to deliver the first atomic bombs; and a squadron then based at Fairmont, Nebraska, in training for assignment to Europe, was selected to form the nucleus of the new organization, which was designated the 509th Composite Group. In late August General “Hap”Arnold, the commanding general of the Army Air Forces, approved the assignment of Lieutenant Colonel (later Colonel) Paul W. Tibbetts to command the 509th. Tibbets was highly qualified for the position. He was a veteran of B-17 missions over Europe and B-29 testing in the United States. In September the 509th moved to Wendover Field, Utah, and began receiving its new B-29s in October. An intensive training program for the 509th took place, designed specifically to prepare the crews for a high altitude release of the bomb, including an escape maneuver that would avoid the shock wave that could damage or destroy the aircraft. In May 1945 the 509th deployed to its intended operational base, Tinian. President Roosevelt died on April 12, 1945 and Harry Truman assumed the Presidency and inherited the responsibility for final nuclear weapon decisions. The first was regarding plans to drop an atomic bomb on Japan. The Target Committee, composed of Groves’ deputy, two Army Air Forces officers, and five scientists including one from Great Britain, met in Washington in mid-April 1945. Their initial intention was to select cities that had not previously been heavily damaged by the Twentieth Air Force’s conventional-weapon bombing campaign, but such pristine targets had become scarce. Finally they tentatively chose 17 cities, in a list that included Hiroshima and Nagasaki. For several years there had been dissent among scientists and political leaders over the morality and necessity of using atomic bombs against Japan. There was no ignoring, however, the fanaticism of Japanese soldiers, demonstrated at Tinian, Iwo Jima, Okinawa, and other Pacific islands. An invasion of Japan would be extremely difficult and would inevitably result in the loss of thousands of lives, Americans as well as Japanese, civilian and military. The next step in development of a weapon was to conduct a live test of a nuclear detonation. The site was to be on a scrub-growth area on the Alamogordo Bombing Range two hundred miles south of Los Alamos. The test was named “Trinity”. After agonizing hours of transport, installation and assembly, including many anticipatory concerns, an implosion bomb using plutonium was installed in a tower and detonated on 16 July 1945. The yield was calculated to have been 18.6 KT. Shortly before the Trinity test the cruiser U.S.S. Indianapolis departed from San Francisco carrying most of the components of what was to be the first atomic bomb dropped on Japan. The bomb was a gun-type weapon called Little Boy. Its destination was Tinian, where the 509th Composite Group was based. Other components of Little Boy were carried from an Army Air Forces base in Albuquerque to Tinian by C-54 aircraft. Components of another bomb, an implosion weapon called Fat Man, intended to be dropped on a second Japanese city, were also carried to Tinian by C-54 and B-29 aircraft. On August 6, 1945, the B-29 Enola Gay carrying Little Boy and piloted by the commander of the 509th Composite Group, Colonel Paul Tibbets, dropped its bomb on Hiroshima, destroying most of the city and causing possibly 140,000 deaths. The weather over the target was satisfactory, and the bombardier, Major Thomas Ferrebee, was able to use a visual approach. The bomb’s detonation point was only approximately 550 feet from the aiming point, the Aioi Bridge, an easily identifiable location near the center of the city. The yield of the bomb was 12.5 KT. On August 9, another B-29, Bock’s Car , piloted by Major Charles Sweeney, dropped Fat Man on Nagasaki. The primary target for Bock’s Car had been the arsenal city of Kokura, but cloud conditions necessitated selection of the secondary target, Nagasaki. Bomb delivery was successful although broken cloud cover necessitated a partial radar and partial visual approach. The number of deaths at Nagasaki was approximately 70,000, less than at Hiroshima because of steep hills surrounding the city. The yield was 22 KT. On August 15 the Emperor of Japan broadcast his acceptance of the Potsdam Proclamation, which on July 26, 1945, had set forth the Allies’ terms for ending the war. In his address to the nation the Emperor cited that the Americans had “begun to employ a new and most cruel bomb, the power of which to do damage is indeed incalculable” and that this, along with the “war situation,” was the reason for his accepting the surrender terms. Rhodes, Richard. 1987. The Making of the Atomic Bomb. Simon and Schuster. Tibbetts, Paul W. 1978. The Tibbetts Story. Stein and Day. Originally published by eHistory at The Ohio State University under a Creative Commons license.